The ‘Spitzbergen Experience’ cruise leads into the realm of polar bears. 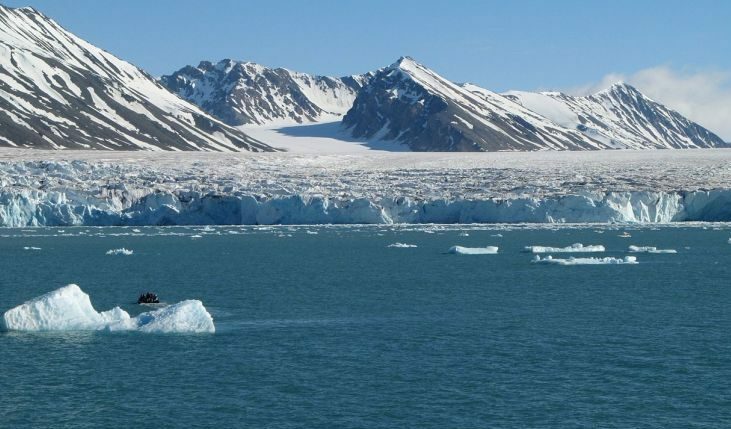 On the MS Fram, passengers can explore the west coast of the largest island in the Svalbard Archipelago in detail. Starting out from the island capital of Longyearbyen, the MS Fram first sets a course for the ‘Sorkapp’ (southern cape) of Spitzbergen. The nine-day expeditionary voyage then leads north along the west coast to the north of the island at a latitude of 80° north. The focus of the cruise entitled ‘Disko Bay Expedition’, meanwhile, is on the breathtakingly beautiful polar worlds, and encounters with the Inuit and their culture. The MS Fram starts off on its nine-day tour from Kangerlussuaq, moving north along the west coast of Greenland until it reaches Disko Bay, where gig antic glaciers and overwhelming ice landscapes mesmerise passengers. In addition to these fascinating natural experiences, high points of the trip include visits to small Inuit settlements. Other providers are also aware of the magnetic attraction of this region, and the AIDA Northern Europe product now takes its guests further north than ever before: for the first time, the AlDAcara now travels to the idyllic Spitzbergen island group, between the North Sea and the Arctic Ocean, while the Lofoten islands, just off the Norwegian coast, are also visited for the first time on a Northern Europe trip. AIDA guests can enjoy the midnight sun and fjord landscape on a trip from Hammerfest to Gravdal via Tromso. These spectacular 17-day trips start out from Kiel on three dates in June and July 2012. Hapag-Lloyd Kreuzfahrten is also setting a course firmly north: on the MS Europa, passengers can enjoy an introductory trip with the eclectic title ‘MS Euro pa meets Sansibar offSylt’. Highlights of this trip include the day-long passage through the Kiel Canal, the island of Sylt, and an invitation to feast at the legendary beach bar Sansibar, a Nordic version of the Cafe del Mar on Ibiza. As the sun sinks slowly beneath the horizon, another unexpected pleasure awaits: a raucous party night aboard the Europa. Anyone wishing to discover their more adventurous side is in the right place: the expeditionary ships Hanseatic and Bremen ofHapag-Lloyd Kreuzfahrten are distinguished by their low draft, categorisation in the highest ice class possible for passenger ships (E4), and their manoeuvrable and robust inflatable boats, 14 and 12 in number respectively. The very latest technology on board ensures the ships can navigate the harsh conditions of the waters of the Arctic and Antarctic Oceans safely and venture deep into the polar regions, beyond the northern and southern polar circles. After a long time out, the Bremen is setting out again in 2011, heading for Alaska, where it will offer two expeditionary voyages to the home of sea eagles and bears. The ship will navigate the legendary North-West Passage in August 2011, while the Hanseatic will take passengers to the eastern section of the North-West Passage at the same time. Convincedyou’ve seen all there is to see in Northern Europe? Then treat yourself to a cruise through the region on one of the ships in the MSC fleet. The fleet travels to the Baltic, Norway and its beautiful fjords, as well as Iceland and the unique Faroe and Shetland Islands. The cities of Tallinn, Stockholm, Helsinki, Copenhagen and Amsterdam don’t just offer lovely tourist attractions, but are also perfect for taking extended shore leave. In general, anyone who loves tumultuous waterfalls, crystal-dear air and fascinating landscapes will love a trip north. Due to the large demand, Cost a Kreuzfahrten now also sends its flagship, the Costa Pacifika, to the Great North: starting out from Hamburg or Kiel, the company offers uniquely lovely routes along the Norwegian coasts to the northern cape and Spitzbergen. Absolutely magical cities await you on the 8-day cruises of the Costa Magica. From Elamburg, it departs for Copenhagen, Oslo, Dover (London), Le Havre (Paris) and Amsterdam. Could there be a lovelier way to travel the most fascinating cities of Northern and Western Europe? No matter whether you decide on a classic Nordic cruise to the serene Norwegian fjords or prefer to dive into the chaos of the region’s most beautiful cities, you can be sure of one thing on all these cruises: you will be warmly welcomed on board.